If you are a believer of true love, this interlocking double diamond heart ring from Apples of Gold Jewelry will brighten your day! Crafted from a beautiful and shining 14K white gold, this ring features a band with a twist as two interlocking hearts come together on top. One heart sits on top of another, and the two are fused together. Inside each of the interlocking hearts is a sparkling diamond, and together the diamonds total 0.02 carats. These beautiful diamonds are rated G-H for color and I1 for clarity. 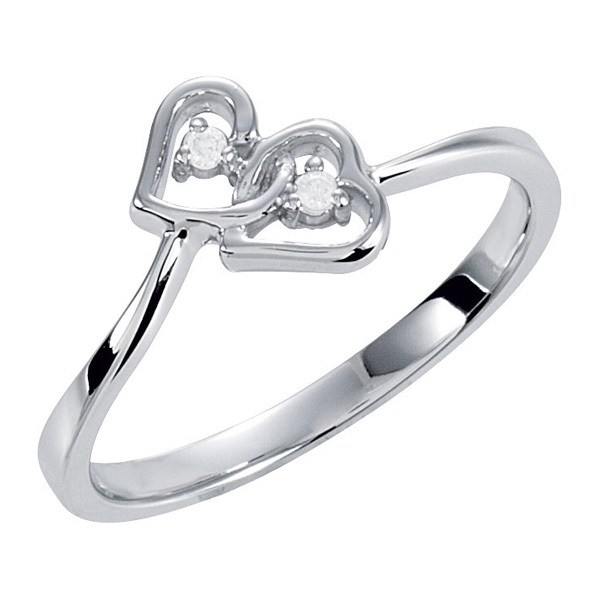 We guarantee our Interlocking Double Diamond Heart Ring to be high quality, authentic jewelry, as described above.